These free Teddy Bear Baby Shower Invitations are a cute way to invite your guests to your baby shower! There are 3 invitations below for you to choose from. The first 2 invitations have wording on them and you just fill in the blanks. The 3rd invitation is blank so you can print your own details with a computer. These Teddy Bear baby shower invitations are for a baby boy. Printing Instructions are provided below. There are several ways to print this invitation. Whichever way you choose, I suggest that you print your invitations on a thicker cardstock for a higher quality invitation. 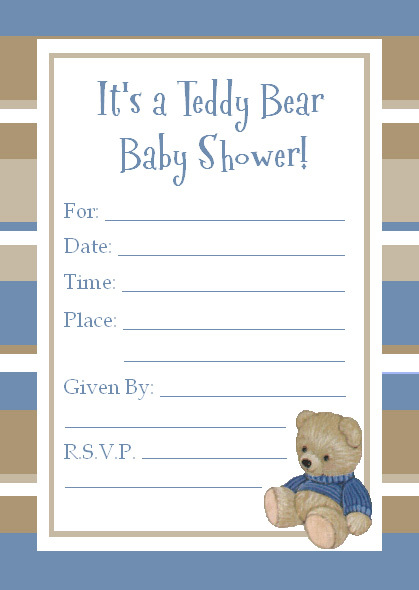 The EASIEST way to print this invitation is to open this pdf printable Teddy Bear invitations and print it from there. I hope these Teddy Bear Invitations help you plan the perfect baby shower!